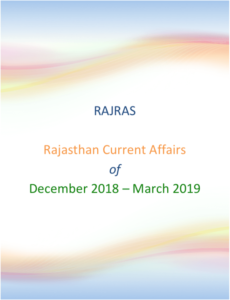 Rajasthan being a dry state is always expected to have very less number of rivers and lakes, but contrary to this understanding Rajasthan is blessed with multiple rivers including larger ones like Chambal and Mahi that also have hydro-electric power stations located on them. Additionally, with the ancestral wisdom of conserving water, Rajasthan has a large number of beautiful, artificial lakes that help fulfill its water requirement during dry spell. 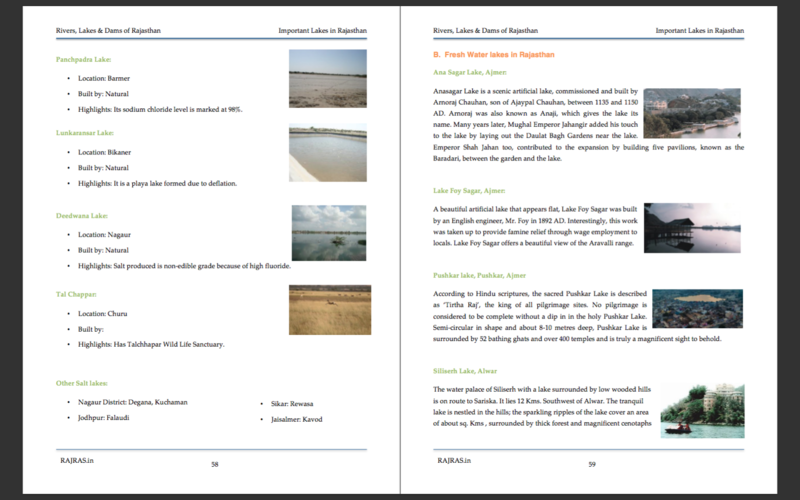 This PDF on Rivers, lakes and dams of rajasthan is an attempt to consolidate all such relevant information in one single PDF. 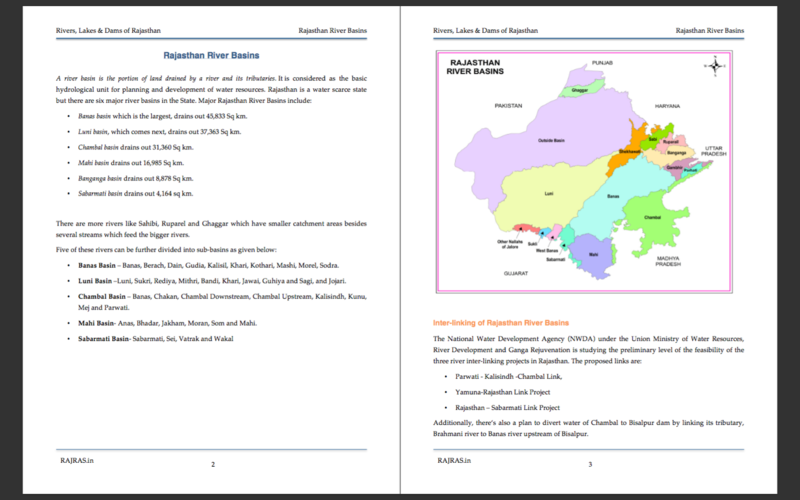 The PDF starts with basic introduction of drainage system of rivers of Rajasthan and their types and describes the different river basins of Rajasthan is short. 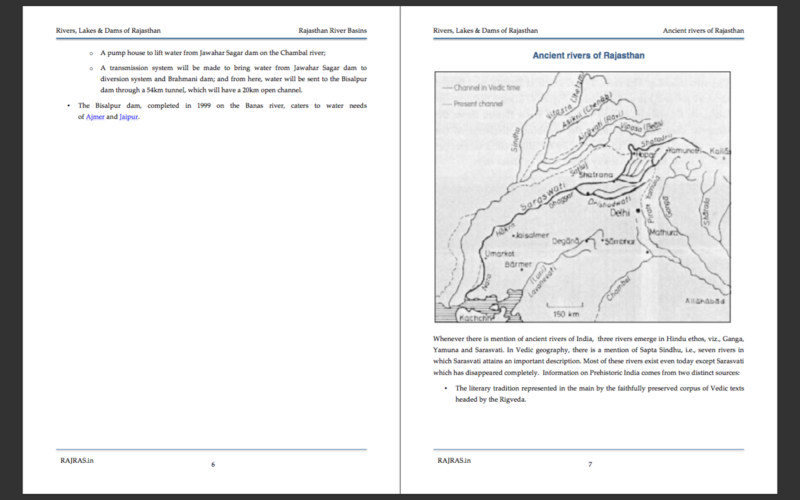 Then one chapter deals on Ancient rivers of Rajasthan, i.e. Saraswati and Drishadvati. Both these rivers, come in discussion every time, history or culture of Rajasthan is discussed. 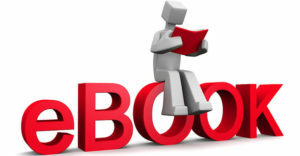 Hence, the chapter explores these two rivers from mythological, archaeological and Scientific research perspectives. 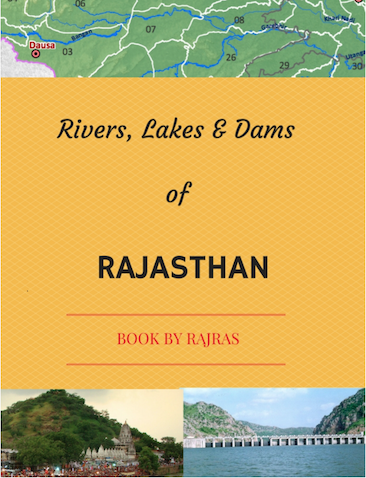 This is followed by a chapter on each of the larger rivers of rajasthan like Chambal, Mahi, Banas and others, where in detail, their origin, course, basin, tributaries and dams have been discussed. Also relevant current affairs with these rivers have also mentioned. 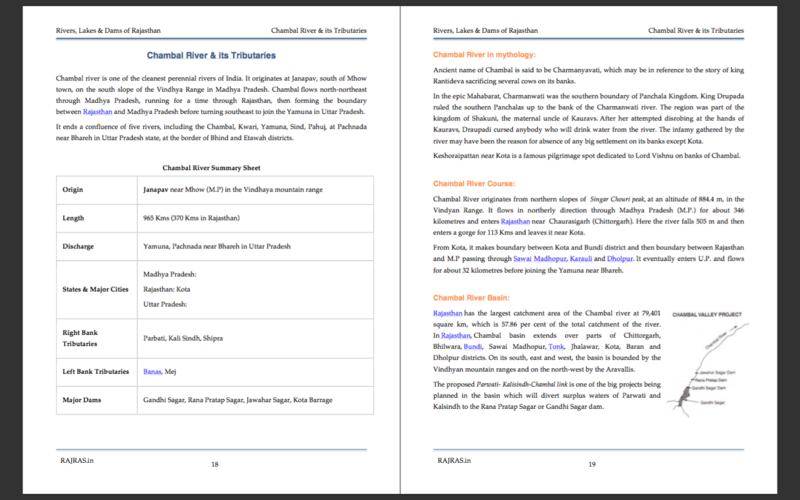 A summary sheet for each river has also been prepared for quick revision. 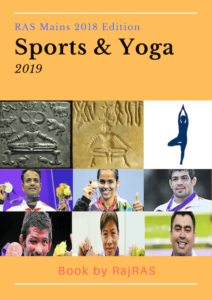 In the end of rivers, each river is listed by the district it flows and vice-versa rivers that flow in each of the districts has also been listed. 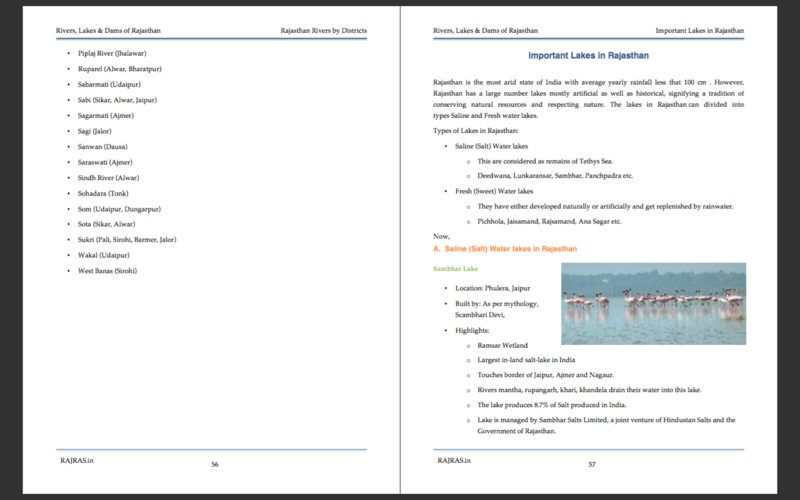 In the lakes section, both salty and fresh water lakes of Rajasthan have been taken up district wise. 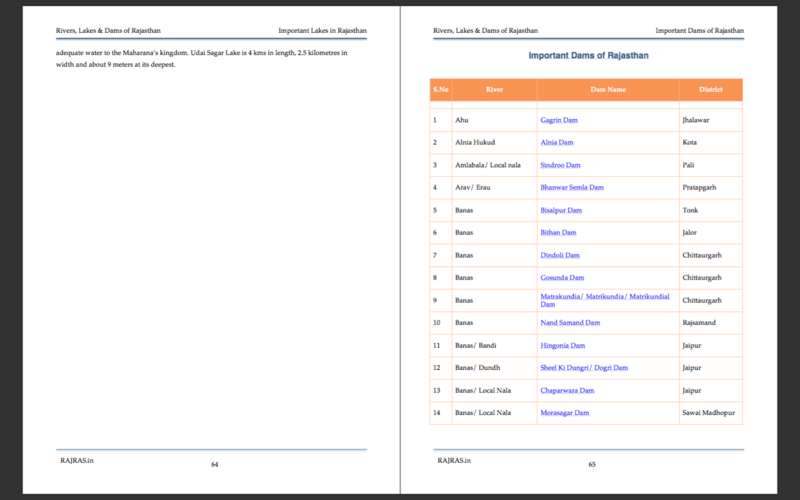 And in the important dams chapter, a list of important dams of rajasthan with rivers and district in which they have been constructed has been made available.